Today the Healthy Climate and Family Security Act was officially reintroduced into the 114th Congress, with support from noted national climate leaders. The press release below from Congressman Chris Van Hollen’s office lays out the details of the “cap and dividend” bill and this commonsense approach to tackling climate change. Cross-posted from Congressman Chris Van Hollen’s media center. 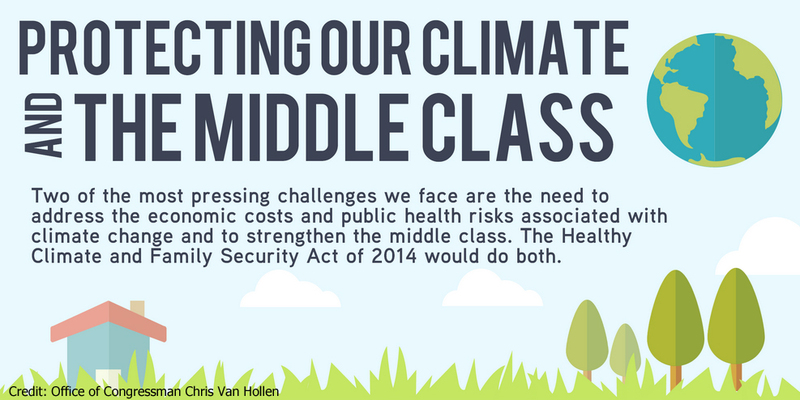 Washington, DC – Today Maryland Congressman Chris Van Hollen introduced the Healthy Climate and Family Security Act of 2015. This legislation is a simple, fair, and effective way to combat climate change while supporting economic growth and a thriving middle class. To read the text of the bill, click here. The bill caps carbon pollution and reduces CO2 emissions gradually but steadily, auctions carbon pollution permits to the first sellers of oil, coal, and natural gas into the U.S. market, and returns 100 percent of the auction proceeds electronically each quarter to every American with a valid Social Security number in the form of a Healthy Climate Dividend. The “cap and dividend” approach taken by this legislation will enable the United States to achieve scientifically driven reductions in greenhouse gas emissions while supporting vibrant economic growth and actually increasing incomes for an estimated 80 percent of American households. “Sierra Club supports the Van Hollen bill because it puts a declining cap and a price on all US carbon pollution; two things that are essential to truly addressing climate change in the long-term. We see this as complementary to the near-term actions in the President’s Climate Action Plan, which we also strongly support,” said Sierra Club Federal Campaign Director Debbie Sease. “The Van Hollen Healthy Climate and Family Security Act is the gold standard when it comes to reducing carbon emissions. It’s the only way to assure we meet science-based emission reduction goals in a timely manner,” said entrepreneur and author Peter Barnes. “The basic idea that we own the sky, not Exxon, is a key part of the endgame in the climate debate. I’m glad it’s getting a Congressional hearing,” said 350.org Founder Bill McKibben. Original co-sponsors of the legislation include Congressman Don Beyer (VA-08), Congressman Matt Cartwright (PA-17), Congressman Alan Lowenthal (CA-17), Congressman Gerald Connolly (VA-11), Congressman Earl Blumenauer (OR-03), Congresswoman Eleanor Holmes Norton (DC), Congressman Raul Grijalva (AZ-03), Congressman Peter Welch (VT-At Large), Congressman Charles Rangel (NY-13), Congresswoman Zoe Lofgren (CA-19), Congressman Adam Schiff (CA-28), Congresswoman Grace Napolitano (CA-32), Congressman Mike Honda (CA-17), Congressman John Conyers (MI-13), Congresswoman Barbara Lee (CA-13), and Congressman Mark DeSaulnier (CA-11). Congressman Van Hollen, Co-Chair of the Bicameral Task Force on Climate Change and member of the Safe Climate Caucus and the Sustainable Energy and Environment Coalition, is a leading supporter of congressional efforts to address global climate change.